Southern California offers the perfect climate for gardening all year round. The warmer spring/summer months and cooler fall/winter months provide growing conditions for almost every type of vegetable or fruit. During the fall months, weeds grow at a much slower pace allowing your garden plants to take in the nutrients they need without you having to weed your garden every two or three days. Having a fall/winter garden allows you to supplement your diet with fresh, nutritious fruits and vegetables that are taken straight from the garden. If you’ve never grown a fall/winter garden before, you may want to start with a small plot and only one or two types of vegetables. 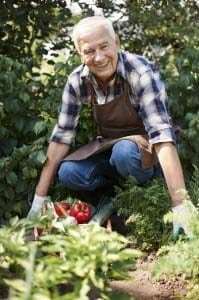 Even if you grow a larger garden during the spring and summer, its best to start with a few plants until you get used to the different types that thrive in the cooler temperatures. As you gain more experience, you can expand the size of your garden and include a larger variety of plants. The more plants you include, the more variety you have on your dinner table. In Southern California, temperatures rarely drop below freezing in the fall and winter months. The ground does not undergo a hard freeze so plants can grow all year round without their roots or buds being damaged by cold temperatures. While spring and summer are considered the primary growing seasons, fall and winter are also ideal times for growing vegetables like beets, celery, carrots, onions, kohlrabi, peas, cauliflower, and spinach. Many vegetables like snow peas have a short growing period which may allow them to be harvested and planted again. Choosing to grow a garden all year round makes for a beautiful, brightly colored garden. While green leafy vegetables thrive during the cooler temperatures of fall and winter, there are other vegetables that grow much better during the warmer season. Tomatoes, squash, corn, cucumbers, and green beans take much longer to mature and produce healthy vegetables. You can start most of these plants from seeds or buy very young plants that have already been started in a nursery. Even by getting this type of head-start, it will still take several months for them to mature. Buying seedlings will prevent the seeds from being eaten by birds or insects. The warmth and direct sunlight of the summer months give the plants the nutrition they need to thrive. Planting a fall/winter garden will make for an excellent growing opportunity if you choose a portion of your property that is bathed in sunlight for most of the day. Since the temperatures are much cooler during the fall and winter months, your plants will benefit from as much sunlight as they can get. With the weeds growing at a slower rate and fewer insects, your plants will be able to thrive without much assistance. Watering your plants once a week or so is still a must but with lower temperatures, there is less risk of the water evaporating before the plants can use it. If you are planting your garden from seed, you will need to prepare the soil before you begin. If you’ve used the same area during the fall and summer, you will have to remove the debris from the previous planting and fertilize the area. Turn the soil and let sit for a week or two. When you’re ready to start planting your seeds, smooth the soil with a rake and create either rows or holes. Soak the soil with water and gently place the seeds in the ground according to the directions for each type of plant. The depth of the seeds and the distance between them will determine how well the plants grow. Placing the seeds too deep into the soil or too close together may make it difficult for them to grow properly. There are several plants that are more difficult than others to start from planting seeds directly in the garden. In this case, using small pots made from peat moss will allow you to plant your seeds indoors giving them a better chance of survival. By keeping the seedlings in a temperature controlled, well-lit area, you can protect them from insects, animals, and the elements. Starting your seeds inside ensures that when you transplant them into your garden, they will be strong enough to survive the cooler temperatures and have a greater chance of taking root. Before you decide to keep your garden going all year long, you need to do your research and find out what vegetables grow best during what season. Buy a book on gardening that discusses what makes a fall/winter garden successful. Talk to someone at your local nursery or greenhouse and ask questions about the different seasons and which plants are the easiest to grow. Start simple with a small area and learn as you grow. Take the time to learn about the vegetables you are planting. The more you know, the better your garden will be. If you garden during the summer, you already have a good knowledge base to start with. There is nothing more rewarding than a plate full of straight from the garden vegetables. Once you get the hang of keeping your garden growing all year round, you will wonder why you never thought of doing it before.